Sometimes our commenters are a little insane — but we love them anyway. And other companies do too. And here’s proof. 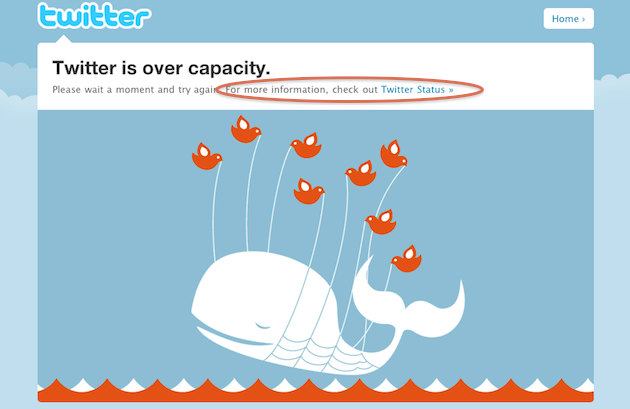 One would assume that the link to the Status blog would be bigger on the Fail Whale pages. New users don’t read the fine print/have the status blog on RSS. As a side note I use Twitter to login with intensedebate, not anymore. “It was a good question and a great suggestion, and our team made the change this week,” a Twitter representative wrote to us. “We’re listening,” they continued. This is a good idea, because previously when Twitter would go down, people would often come to sites like TechCrunch to find out why. To be clear, we hope you still do that. But it’s good for those who don’t, to have a link to the Status Blog (which resides on a different server from Twitter itself, so it stays up during downtime) for updates from Twitter on the situation. So there you go TechCrunch readers, leave a useful comment, and it just may make a difference.